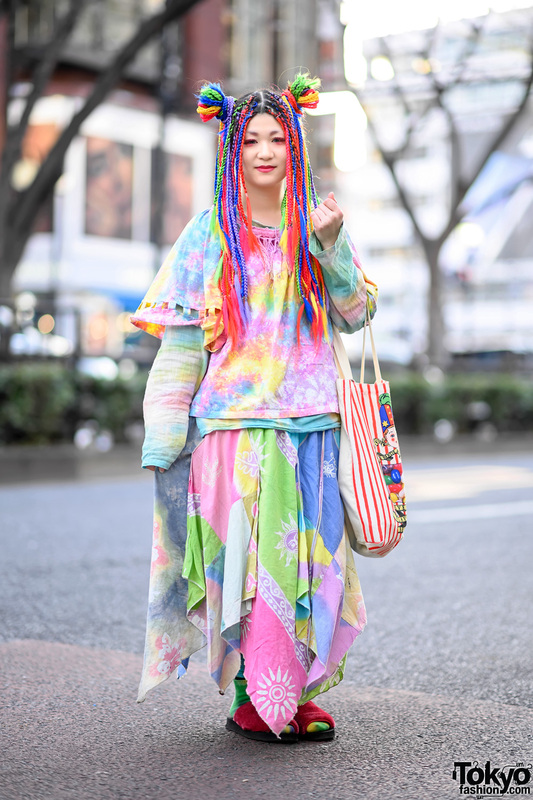 We spotted this brightly dressed 17-year-old Japanese girl near the intersection of Cat Street and Omotesando Dori in Harajuku. The first thing that caught out attention was her huge green hair bow, which matches her green and black striped top and green skirt. To contrast the green, she’s also wearing quite a bit of pink – including a pink patterned skirt, pink necklace, pink bracelets, and those shiny pink & black heels. 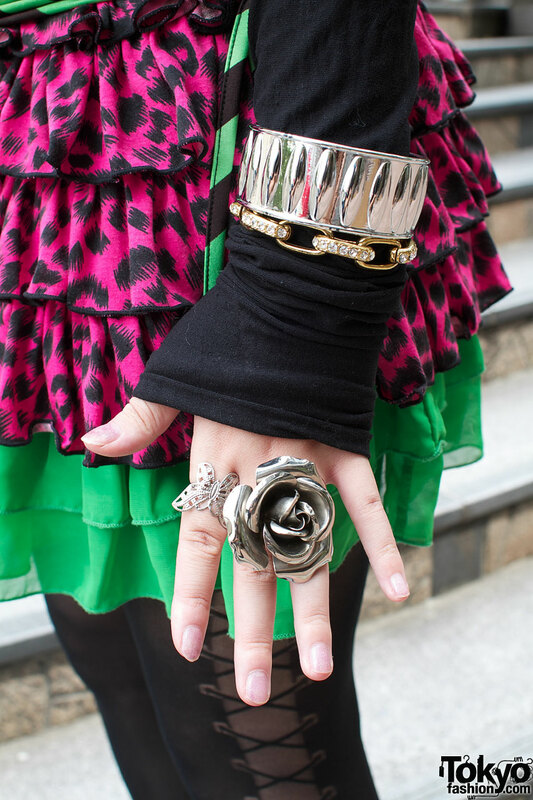 She told us that almost all of the items that she’s wearing came from resale shops, and that includes her massive silver rose ring. 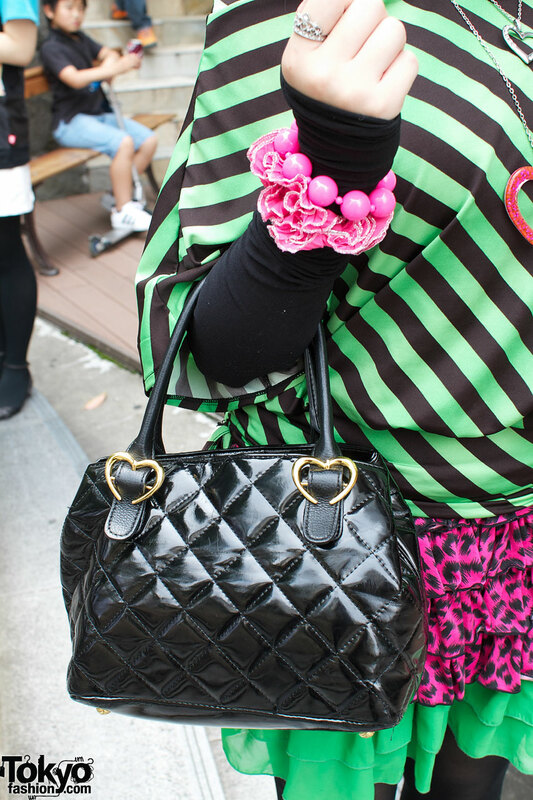 Not everything is resale, though, as she did purchase her quilted handbag at Shibuya 109. Besides all of the cute accessories, she also has a labret piercing. When we asked her what her favorite band is, she answered Maximum the Hormone! Note: This update is from a series of street snaps that were taken in the summer for a print magazine. The magazine didn’t need all of the photos, so we are running the remaining snaps here on Tokyo Fashion. Some of the styles may be more Summer than Fall, but they have never been seen before and we didn’t want them to go unpublished. Wow i love the tights! Nice…reminds me of the 80’s for some reason. But still very colourful and quiet “sassy”! Those tights! I love them. I loved this, head to toe, it does remind me of the 80s which is probably why I like it so much, she has gorgeous eyes too. OMFG! i want to dress like that girl, her outfit is AWESOMEE!! I LOVE IT! I love love love her style !!! Especially the skirt, the tights and the hair bow ! I like her make up too ! It suits her very well ! She is like pop soda: colourful, tastey and full of bubbles. I love herrr! That goes so well together, and it fits her perfectly. cutest girl EVER on here!! love how sassy she is in the mid and head shots! Makes her legs look shorter, but besides that AMAZING!!! If I was a teenager I’d be following after her on a leash. Very nice colours and style. She makes it all work. Not a fan of the top really… But otherwise it’s well put together. awesome outfit, pretty girl as well! I love it, very unique. Love the black undershirt and rings a lot too.